KU Faculty of Medicine held seven scientific conferences on various topics including HIV – AIDs, Hemophilia, Hepatitis, Tuberculosis, and a joint conference with British Columbia University to compare Medical Studies in Afghanistan, the Region and Universities in Canada. Kateb’s Medical Research Center (KMRC) has recently being launched with the vision to support faculty members and research department of the university. Animal House and Medical Labs are parts of the facilities of KMRC. Through KMRC, members of medicine faculty at KU are also provided small-scale research grants for implementing their research projects. KU Faculty of Medicine has published ten books which are used as textbooks and references at the university. The eights paper was presented by Dr. Safi on “Role of GeneXpert technology in Early Detection of Rifampicin Resistant Patients in Afghanistan”. 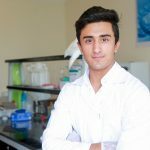 Mahdi Mohaqiq published a research article titled “Successful Human Spermatogonial Stem Cells Homing in Recipient Mouse Testis after In-Vitro Transplantation and Organ Culture” in Impact Factor Journal.